Kitty Mouse or Cat Sack. 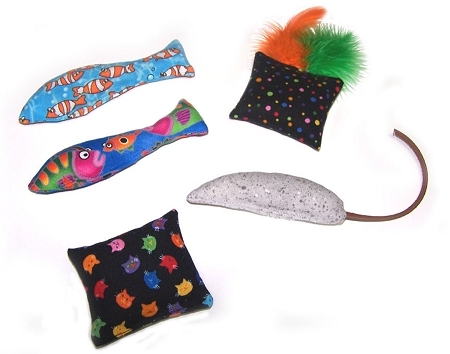 Your cat will have hours of fun stalking, tossing around, licking, rolling and eventually passing out with these brightly colored catnip toys. They are just the right size to carry around and play fetch with. All of the toys are hand made from our own unique designs using the fabric and colors as shown. The Kitty Birdie feathers may vary in color. Filled with our own organically grown catnip that's harvested and dried at it's peak. Very potent nip ! All Catnip toys are made up fresh at the time of order. "Kitty Trout" measures 4 1/2" from nose to end of fin. "Kitty Mouse" measures 4" not counting its rawhide tail. "Kitty Birdie measures 2" x 2 1/2" not counting feathers. 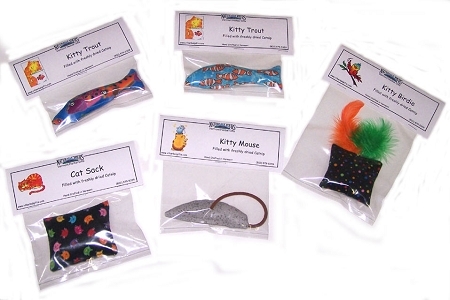 "Cat Sack" measures 2 1/2" x 3"
Packaged in a clear bag that includes a cute Kitty Trout, Kitty Birdie, Kitty Mouse or Cat Sack label. All of our herbs are grown or wildcrafted by us or purchased from reliable organic sources. My cats got these as a gift from my mother in law. They are so madly crazy about them! You make a great catnip toy! Thank you! I bought a few of these for my cats at the BigE this year...so sorry I didn't buy more at the time. My four cats loved them. It's been two months and they are still played with and they have held up well. I'm ordering some today for Christmas gifts..but will definitely plan to stock up next year at the Big E.
Our cats, Lamia and Isis, LOVE your catnip toys! Their "Aunt Rachel" brought them as gifts all the way from the Big E fair when she visited us in Florida last year and the toys were so loved, we requested them again this year. We took a video of Lamia enthusiastically opening one. If you'd like us to send it to you, send me your email and I will send you the video! Got the cats these for christmas, they've been coming back to them all day. Nuzzling, chewing, batting--they've held up great so far!